We offer various forms of transportation services. 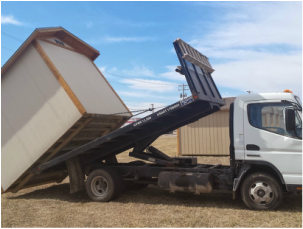 We can do everything from in yard moves to moving sheds to an entirely new location. Sizing and access will determine the price of the move. Tree trimming, fence removal, excessive blocking, and framing modification may all be an additional charge. These prices only apply to For Hire moves of your existing building, not the purchase of a new building from us. *The Mule travels with our low-deck trailer and is useful for precise placement as well as in yard moves. A $50 Callout Fee (nonrefundable) is due at the time of scheduling, this will apply toward your final bill. 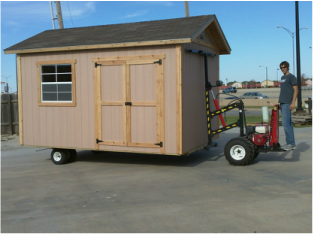 Please call us with any questions if your shed was not built by us or one of our local peers to ensure it can be moved using this type of equipment. *All Size Shed will do their best as to see there will be no negligence in the transportation of buildings, however there are times that unforeseen things can happen during transport that can result in the damage of the building. Which may include loss or damage to: siding, shingles, trim, flooring as well as other features on the building. Damage can also occur to the yard and other pieces of property. If damage occurs without negligence All Size Shed Co. assumes no responsibility to fix or replace damages.